Maurice Blackburn pursues compensation claims for people whose health has been damaged by asbestos. We have also established a register for people who have been exposed to asbestos material but have not experienced ill effects – just in case things change. Exposure to asbestos fibres and dust can result in diseases that often don’t reveal their symptoms until decades later. Asbestos-related diseases and cancers mainly affect the respiratory and gastro-intestinal systems, but they can also occur in other parts of the body. If you have been diagnosed with an asbestos-related disease or cancer, or if you are concerned about your asbestos exposure, Maurice Blackburn can help you access support services and claim compensation. We have a team of specialist asbestos compensation lawyers who can help people suffering from asbestos-related diseases make a claim for compensation. Because we’re a national law firm, with a hard-earned reputation for standing up for the rights of everyday Australians, we’ve got the resources and the experience to fight for your rights and provide legal assistance in whatever areas you need. Your first consultation with one of our asbestos lawyers is free and without obligation. If you decide to proceed and we believe you have a viable claim, we will act on a “no win – no fee” basis. If you need information or assistance with making a claim, phone us on Free Call 1800 675 816. Asbestos common law compensation claims must be lodged in court during the lifetime of the asbestos disease sufferer. Some people may also be eligible for statutory benefits from Centrelink or WorkCover. Contact Maurice Blackburn to discuss your exposure, even if you’re not sure where or when you were exposed to asbestos. We’ll investigate your asbestos exposure, even if the place where you were exposed is now out of business. We’ll submit your claim and fight for the best result. We’ll help you settle out of court in the vast majority of cases, or go to court if the settlement offer isn’t fair. If you have been diagnosed with an asbestos-related disease, your first priority will be your health. 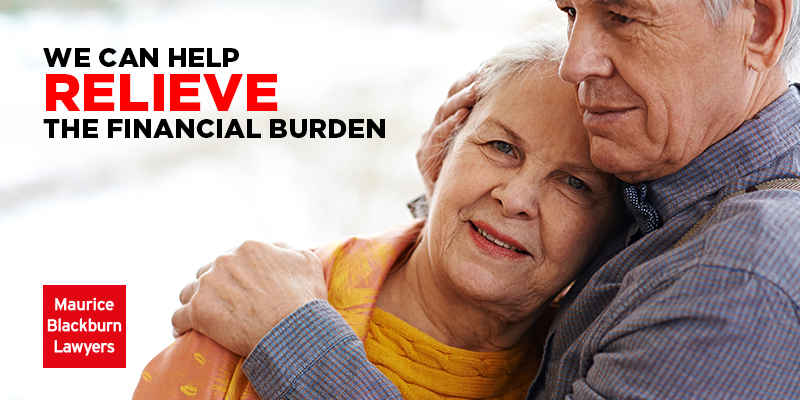 But financial compensation can relieve the burden both you and your family will be feeling. Maurice Blackburn’s specialist asbestos lawyers are very experienced, and have helped thousands of people with successful claims in every state of Australia, such as Eric King, for whom we achieved the largest ever payout in Australia for an asbestos compensation claim. We work with asbestos disease sufferers and their families to minimise their inconvenience and stress, and offer a simple and thorough approach. We will visit you in hospital or at home, without charge or obligation, to discuss your entitlements and the claims process. Should I register my asbestos exposure? It’s a good idea to document any asbestos exposure in case you do develop an asbestos-related disease later in life. Maurice Blackburn’s free National Asbestos Register is a convenient way to do this. Recording the details of your asbestos exposure, regardless of how recent or long ago it was, can help any future claims for compensation you may need to make. Registration is free, and obligation-free as well. What types of diseases qualify for asbestos compensation? asbestos-related pleural diseases and pleural plaques. Do I qualify to make a claim? What can I sue for under my common law rights? loss of future earning capacity if you were working at the time of your diagnosis. In some states such as NSW and South Australia, you may also be able to sue for past and future domestic expenses or care for a child/dependant that you can no longer provide due to your asbestos-related disease. Who can I sue for asbestos compensation? occupiers of sites where asbestos was present. If you were self-employed, you may still be able to sue manufacturers and occupiers of sites where you worked. Maurice Blackburn has a team of specialist and highly experienced asbestos disease lawyers who are able to provide advice and assistance to you and your family. We understand that every moment is precious for someone who suffers from an asbestos disease and we can help streamline your legal access to compensation to give you more time and provide legal assistance in whatever areas you need. If you have questions or need help with a claim, talk to a member of our asbestos practice today, even if you’re not sure where or when you were exposed to asbestos.